What is better than a cookie? A Sandwich Cookie!! 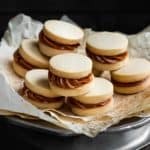 These Eggless Dulce de Leche Shortbread Sandwich Cookies are buttery, rich incredibly tender and delicious. 9 filling ideas included. Beat sugar and butter with an electric mixer for 5 - 7 minutes, or until fluffy and pale. Add vanilla and mix to combine. Roll the dough out between two pieces of parchment paper to ¼ inch thick. Refrigerate for 30 minutes. Remove baking trays from oven and let the cookies cool on the tray. When the cookies are cool, spread half the cookies with a dollop of Dulce de Leche. Then sandwich with remaining cookies. If you want to get the swirl look to the dulce the leche, like in the pictures, put dulce de leche in a pastry bag fitted with a star tip and pipe in a circle on one cookie, then place the other cookie on top. How long can you keep shortbread cookies? Filled cookies can be stored in airtight containers at room temperature up to 2 days. Unfilled cookies can be stored in airtight containers at room temperature up to 7 days. Can you refrigerate shortbread cookie dough? Yes, it can be refrigerated overnight or frozen up to 3 months, covered tightly with plastic wrap. Thaw frozen dough overnight in the refrigerator before using.